This is a very small book, measuring only about 4 inches wide and 5 inches tall. But, its size accurately reflects a time when paper was much less abundant than it is today. 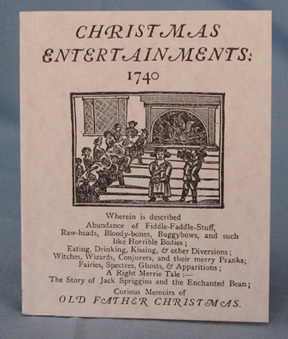 This is certainly NOT a book for a child trying to find out "how they celebrated Christmas long ago." If the customs were the same in the colonies, you can understand better why the Puritans in Massachusetts supposedly banned Christmas. As was mentioned in the table, there is hardly any mention of the sacred meaning of Christmas. The book begins with a discussion of "gambols, eating, drinking, kissing, and other diversions." For those familiar with nineteenth century parlor games, there is even a mention of the game "Puss in the Corner." Later chapters discuss stories about ghosts, witches, fairies, and similar subjects.